Bold, brash and larger than life: Vegas is the USA at its most extreme. It’s also the USA at its most enjoyable. Immerse yourself fully in this OTT neon wonderland, and you’ll find it hard to tear yourself away. There’s delicious food, outrageous circus acts and, of course, those mammoth casino complexes. Forget day tours or sightseeing; in a destination like Sin City, it’s the hotels and their attached gambling joints that are truly the attractions. After all, it’s not often you can be in New York, Paris and Venice in one night. 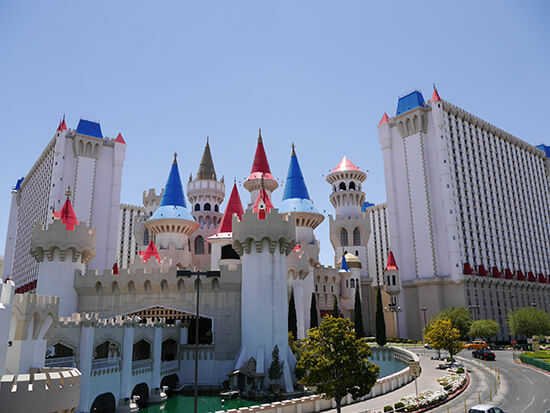 With its red and blue turrets and fairy tale quality, Excalibur – at the very south end of The Strip – is a great place to start your casino exploration. Not only that, but it’s the perfect spot for a feast too. The on-site ‘Tournament of Kings’ is one of the most beloved dinner and show experiences in the city. Think King Arthur and the Round Table, but with pyrotechnics and other special effects, combined with a lip-smacking three-course meal. So if you like swordplay and horses, gallant knights and fair maidens, then this is the hotel for you. Eat New York-style pizza, stroll a replica Brooklyn Bridge and ride the Big Apple Coaster – this Manhattan-themed hotel has it all. You can even soak up the city’s Celtic roots at the ‘Nine Fine Irishmen’, a pub that offers delicious Irish grub as well as stouts, ales, lagers and spirits from the Emerald Isle. 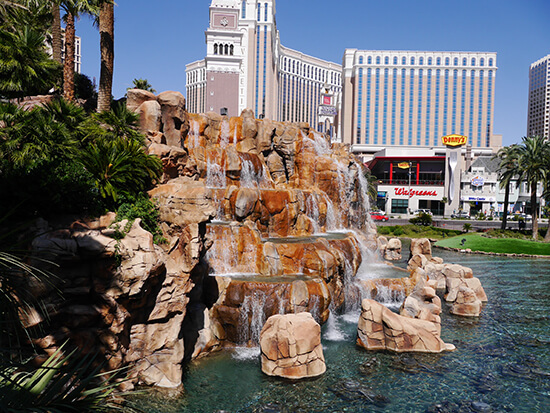 There’s a reason The Bellagio’s fountains are famous. Dancing spurts of water may not sound that exciting, but when you see them in the flesh – jetting skywards in time to music – it really is a mesmerising experience. And what makes them even better? Well, they’re free! Choreographed to more than 30 different songs, you can catch the show every half hour 3-8pm, and every 15 minutes 8pm-midnight. Of course the hotel itself is pretty impressive too: it’s the home of ‘O’ by Cirque du Soleil and also boasts a conservatory and botanical garden. J’adore this hotel. Its replica Eiffel Tower may only be half the size of the real thing, but viewing The Strip from the observation deck, 46 floors up, is still pretty impressive. 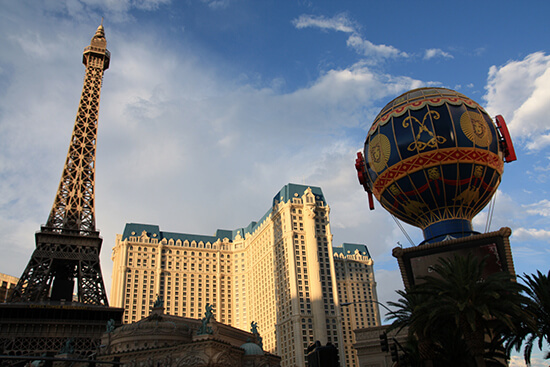 Soak up 360-degree vistas, have the resort’s ‘Ambassadors’ point out key Vegas landmarks and – if you love a bit of romance – why not dine at the Eiffel Tower Restaurant, on the 11th floor? Perhaps one of the most famous hotels on The Strip (and not just because it featured in several episodes of Friends! 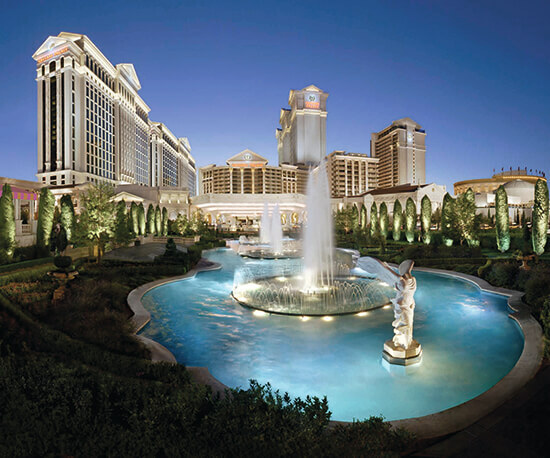 ), Caesars is a Mecca for shopping and fine dining. There are around 160 speciality stores, restaurants and attractions in The Forum Shops, which are often described as ‘The Shopping Wonder of the World’, including some of the biggest names in fashion: Versace, Gucci and Louis Vuitton, to name a few. 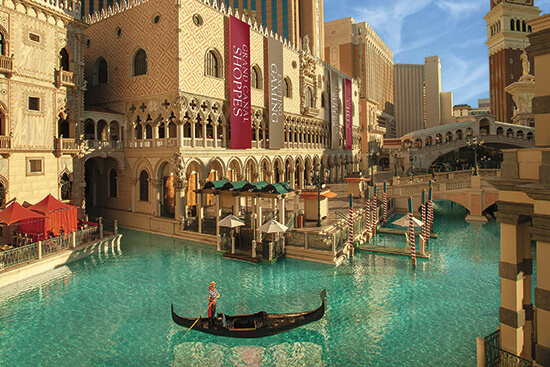 Cruising through the canals of The Venetian on a gondola, you’ll be forgiven for thinking that you’re really in the Italian isle. And no trip to Venice (or The Venetian for that matter) is complete without a ride. You’ll glide past vibrant Italian streetscapes inside and out, under romantic bridges and next to shops and cafés, all the while serenaded by a gondolier. Fun, romantic and a bit olde-worlde, it’s a great way to relax and take in the Vegas buzz in a peaceful manner. To get some real bang for your buck, watch the fiery, lava-spurting volcano (pictured above) at The Mirage, particularly impressive when you see the reflections in the hotel’s shimmering golden exterior too. Cool off with the resort’s water attractions – namely the Siegfried & Roy’s Secret Garden and Dolphin Habitat and the 20,000-gallon saltwater tank behind the front desk, home to a whopping 450 fish. 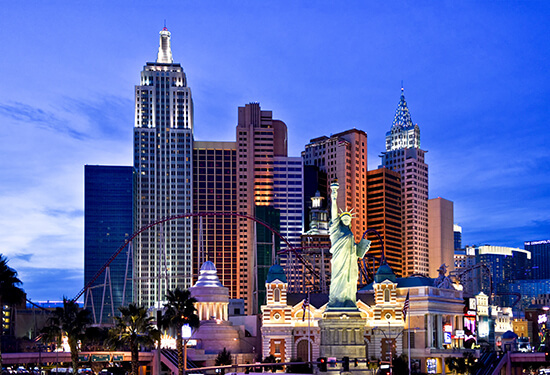 Discover the very best of Las Vegas via our tailor-made Las Vegas holidays or chat to one of our Travel Experts today.